How does skip size impact on cost? Skip hire is a great way to get rid of unwanted waste but the cost depends on a number of factors. Location can sometimes affect how much you pay for skip hire. The cost of skip hire in Chorley may differ to the cost of skip hire in Bolton, Leyland, Preston or Wigan – it simply depends on the local council. 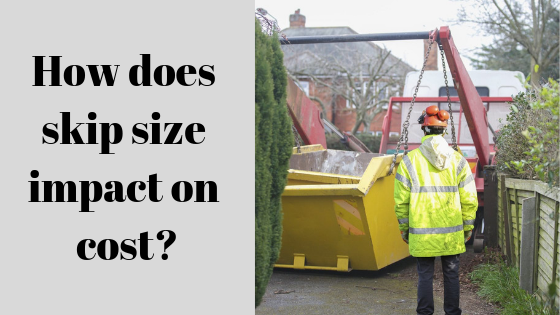 One of the biggest contributors to the cost is the size of the skip, with smaller skips being more affordable than larger ones. To keep the price low, consider recycling as much as you can. Recycling frees up valuable space inside your skip, allowing you to fit more in and preventing you from needing a second one. Whether it be skip hire in Leyland or Preston, A1 Skips aim to recycle 80% of the materials that are disposed of in skips, taking them to the recycling centre. The mini skips are the smallest skips that we provide at A1 Skips. They are perfect for DIY projects that generate little waste. Sometimes, customers order a second skip to separate waste materials like plasterboard and gypsum. If you’re looking to throw out no more than 35 bin bags, the 2-yard mini skips are ideal and they are the cheapest available – starting from £60.00. Ranging from garden clearances to house clearances, you’re bound to be left with a pile of rubbish to get rid of. Midi skips, like the 4-yard ones, are priced affordably and surprisingly spacious – providing enough space for 55 bin bags. Starting from £100.00, our midi skips offer an affordable disposal solution. For those looking for something a little bigger, we have maxi skips available. We deliver them to all locations across the North West – including Preston. Our maxi skips for skip hire in Preston, and skip hire in any other area, are best suited to garden and construction projects that generate large volumes of waste. Offering sufficient space for 80 bin bags, the maxi skips are great for domestic and commercial clients alike. These skips tend to be priced between £150.00 – £375.00. Commercial projects generate much more waste than domestic projects – hence why we supply open skips. The open skips, supplied for skip hire in Wigan, are suitable for mixed waste, including garden and construction waste. Open skips have a huge waste capacity – they can easily fit 100 bin bags of rubbish. Prices for these domestic skips start from £170.00. Our roll on – roll off skips for skip hire in Chorley, Bolton, Wigan and Leyland all have a substantial waste disposal capability and are easy to deliver and collect. They provide easy access for large, bulky items – making them the preferred choice of commercial clients. The roll on – roll off skips are also designed to fit on the back of loading vehicles which incorporate the latest technology. Are you planning to produce more than 400 bin bags of rubbish? If so, a Ro-Ro skip is exactly what you need. Ro-Ro skips can be hired from as little as £290.00 and are provided in 20 and 40 cubic yard containers. To find out how much skip hire costs in your local area, request a quote here today.